Bodies litter the stage, strewn limp in front of a bleak grey tarpaulin-like curtain. Amongst the bodies a dishevelled vagrant – tenor Robert Murray –sings the Ständchen from Schubert’s Schwanengesang, his tone dark and plaintive, accompanied by an invisible piano. The bodies recede, as if dragged by unseen forces, under the gap in the curtain, while one remains writhing and contorting before the singer. The visceral first half of contemporary circus company Circa’s En Masse, receiving its world premiere at the Brisbane Festival, paints a grim picture of the end of the world: an abstract, post-apocalyptic nightmare set to a soundtrack of Schubert lieder and an electronic score by Klara Lewis. 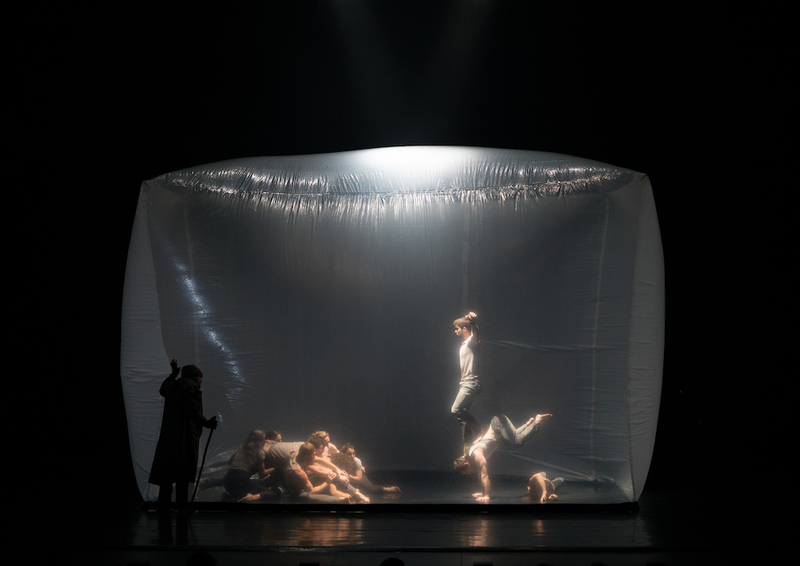 Mingling contemporary dance and circus, the show unfolds in episodes, the music of Schubert (songs from Schwanengesang and Winterreise) and Lewis’ score alternating. Violent, scorching electronics accompany jolting performers caged in an inflatable cube, the acrobats leaping for the sides and ceiling. As he sings In Der Ferne, Murray gazes in at the imprisoned humans, at one point touching his hand to that of a captive through the clear barrier. 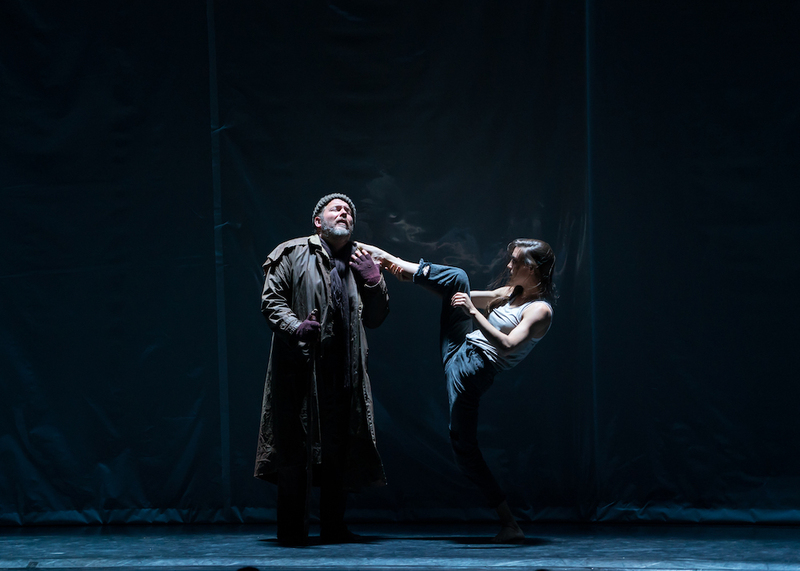 The behaviour of groups and individuals is at the heart of Circa Artistic Director Yaron Lifschitz’s work, and in the seething mass of bodies there emerge moments of both desperate cooperation and destructive self-interest – and it’s not always clear where one begins and the other ends. Performers run across the front of the stage – some leap over others to get ahead, others pull, carry or throw their comrades forward. The movements are deliberately chaotic and sloppy, but the Circa performers’ hair-raising virtuosity is always on display: a three-person-high tower is poised in the air before pitching forward vertiginously, the acrobats collapsing into rolls. In another episode a single performer rails alone against the now half-deflated cube, scrabbling at his prison. On the bare stage (except for Tamara-Anna Cislowska at the piano) acrobats group together in solitary couples for Gute Nacht, while later Lewis’ electronics accompany movements both balletic and brutal as acrobats jump from prone bodies – one leaping from an alarming distance to land feet first on his colleague’s chest. Bodies become objects, limp corpses to be carried, thrown and dragged. From those ashes, a new civilisation is born in the work’s second half, Stravinsky’s The Rite of Spring (in its two piano version, Michael Kieran Harvey joining Cislowska on stage) accompanying more refined, ceremonial movements against an open stage. From the ambient beginning which sees a spot-lit performer, hands aloft, spinning slowly in the stage’s centre, the work is no less athletic, bodies spasming here with vibrant new life rather than decay, the ensemble blossoming into elegant structures and flower or tree-like arrangements on the stage, all to Stravinsky’s glittering, percussive score. Stunning human pyramids and towers here are an ecstatic reaching – transcendence rather than desperation – and this half of En Masse features some of the most virtuosic acrobatics, performers thrown incredible distances in a joyous, earnest display of vitality. While the two halves of En Masse definitely speak to each other, the very different musical sources and differences in the physical language give the sense that these could be two distinct, stand-alone works – overall the work feels like a clever double-bill rather than a single unified piece. Nonetheless, En Masse is a powerful, fascinating work that delves into the best and worst of humanity in thrilling, virtuosic physical movement, beautifully rendered by musicians and Circa performers. It may be based on a fairytale, but Angelin Preljocaj’s steps are only for adults to dance.